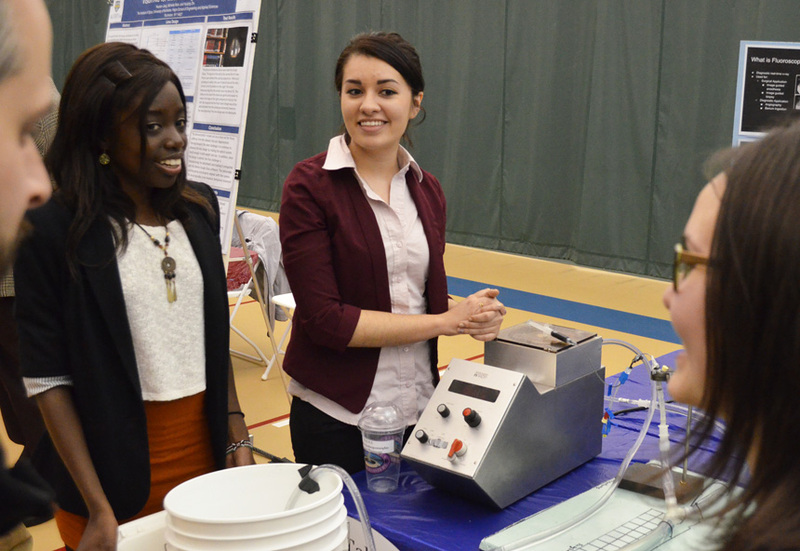 Jenny Quintero, center, with Sandra Oluoch, left, and Susan Butler, two of her biomedical engineering teammates, demonstrate their senior design project: modifying a Carestream Health radiographic phantom to measure dynamic latency, simulate flow, and show sufficient contrast between flowing substances and surroundings. "The STEM Gem program significantly helped me reach and surpass my goals"
As graduation is close at hand, I am truly amazed at how far I’ve gone. In my family, I’m the first to go to college, the first to go so far from home, the first and only to study abroad, and the first to pursue a career in Biomedical Engineering. When I look back at all these accomplishments, experiences, challenges, and my future, I am truly grateful for the STEM Gem program and for its advisors. Their guidance, support, motivation, and opened opportunities have led me to where I am today. The most exciting, valuable, and rewarding part of my undergraduate experience has been my research experience as a McNair scholar, having been introduced to it by my STEM Gem advisor, Nick Valentino. Through this opportunity, I worked on developing Poly(Ethylene Glycol) hydrogels with tunable properties that could be used to deliver siRNA for the healing of non-union bone fractures. I got hands on experience doing in vivo surgical implantations on mice. I learned how to communicate my findings and technical information by delivering presentations and scientific papers to a wide array of audiences. This experience truly spurt my drive for being at the forefront of medical innovation. For this reason, I am looking forward to a graduate school experience in the field of Biomedical Engineering, where I will strengthen and acquire more knowledge that will allow me to engineer and innovate cutting edge medical technologies. In addition, I studied abroad in Sydney, Australia. With something that seemed so unrealistic to me to begin with, studying abroad became a reality due to the guidance from my STEM GEM program advisors. Going out of state for school was already a big step for my family and I, but going abroad was a huge leap that my advisors encouraged me to take. They even helped me out by writing a recommendation letter for the Gilman Scholarship program, allowing me to go abroad. This was also a very rewarding experience; I took several engineering courses and gained a lot of hands-on lab work experience. I was exposed to various backgrounds and points of views while working on team projects, laboratories, and community service events. Through these collaborative, technical, and career-oriented environments, I have exercised my communication, critical thinking, and engineering skills, making me a resourceful engineer and researcher. The biggest help however from my Kearns and STEM GEM advisors was during the graduate school application process. They helped me in everything, including peer editing my personal statement, providing resources for GRE preparation, and writing letters of recommendations. As a minority and first generation college student, I knew very well at the start of my undergraduate career that I had a big challenge ahead of me. But now that I am almost finished, I can honestly say that the STEM GEM program significantly helped me reach and surpass my goals. They gave me all the resources needed to overcome my challenges. The program also introduced me to a world filled with opportunities, and they have been a great contributor to where I stand today in my professional path. Today, I am close to graduating with a Bachelor of Science in Biomedical Engineering and a minor in Chemical Engineering while I perform extensive lab research in tissue engineering. I aspire to pursue a higher education at graduate school with the vision to become a leading contributor to the nations health care and biomedical innovation.